Bob Sonnenblick has always been a guy who speaks his mind, and—if the above quote is any indication—he didn’t disappoint Thursday morning when asked whether “green” was a driving force behind hotel development during a panel at the Bisnow Lodging Investment Summit. The principal of Sonnenblick Development LLC presented his argument as a matter of dollars and cents. “If the customer won’t pay the extra money for that project to be green, then the whole concept is bulls— in our business and it won’t last,” Sonnenblick argued. To his credit, Bob Sonnenblick (right) didn’t mince words when sharing his thoughts on sustainable development. 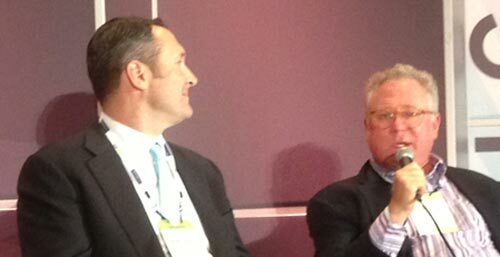 Fellow panelists, such as Buccini/Pollin Group’s Dave Pollin (left), didn’t share his views, however. I admire the man’s conviction. As for his argument? It’s my turn to call BS. Sonnenblick is absolutely correct about the premium of green—or the lack thereof. Study after study shows customers will not pay a dime extra to stay in a sustainable hotel. But there are other important factors to consider. First, Sonnenblick failed to account for lost business. Going back to his original example with the two identical hotels, Mr. Customer might not pay more to stay in the green hotel, but he likely would book there over its non-green competitor across the street. As even more studies have shown, an increasing number of consumers favor sustainable businesses, and many large groups and government agencies will only book at hotels that meet certain sustainability standards. Speaking of government, there’s also the issue of increased regulation. Sonnenblick can scream about rate premiums all he wants, but the point is moot if and when the U.S. government begins to require eco-conscious development and operations. Many municipalities and states (see: California) have begun to do so, and it’s already a fact of life in Europe, where carbon counts and credits are an accepted facet of the business ecosystem. Third, and as we’ve reported time and time and time again, there are real cost-savings to be had, provided an owner or developer holds the hotel long enough to recoup some of that up-front investment. And finally, Sonnenblick’s argument in and of itself is antiquated. Green isn’t a matter of either/or anymore. It’s too deeply ingrained in our everyday products and practices. From light bulbs to wall coverings to washing machines, things are simply built more sustainably, more efficiently. They’re “green” by default. You can’t avoid it. A developer choosing between building a sustainable hotel or not is like a marketer deciding whether or not to the use the Internet or mobile channel. To his credit, Sonnenblick did acquiesce on the moral side of the argument. When fellow panelist Mark Purcell of Starwood Hotels & Resorts Worldwide said any short-term costs pale in comparison with the long-term future of his grandchildren, Sonnenblick agreed. I would counter that hoteliers who fail to recognize broad-scale shifts in business, culture and society won’t last. When it comes to sustainability, the train already has left the station. It appears Sonnenblick has been left standing on the platform.